Sri Lanka, the tear-drop island country lapped by the Indian Ocean is one of the most preferred tourist destinations among Indian citizens as it is close to India. This small pearl shaped island is known for its enchanting ancient ruins, endless soft-sand beaches, imposing mountains, rich culture, colourful festivals and dense wild-life. The ancient ruins of Anuradhapura and Polonnaruwa, the Temple of the Sacred Tooth Relic, Dambulla Cave Temple, the Lion’s Rock Fortress at Sigiriya, Nuwara Eliya, the stunning beaches of Unawatuna and Bentota, Ella and Yala are the top places to visit in Sri Lanka. To travel and experience the beautiful country as part of Sri Lanka Tour Packages, then all the Indian nationals need to apply for Sri Lanka Tourist Visa. 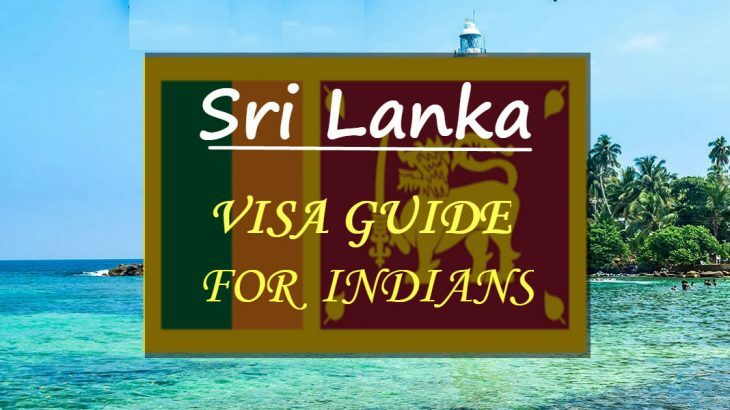 Check here is the comprehensive Sri Lanka Visa guide for Indian travellers. Indian travellers who want to visit Sri Lanka for tourist purpose, need a visa in order to get a legal entry in the country. Luckily getting a tourist visa for Sri Lanka is not that difficult as India is Sri Lanka’s top source of tourists followed by China, UK and Germany. Sri Lanka has also developed the Ramayana Circuit to woo Indian tourists by identifying several places connected with the ancient Indian epic Ramayana. In 2018, around 450,000 Indian tourists visited Sri Lanka and are expecting to cross one million mark in 2019. With such an impressive influx of Indian tourists, the government has made tourist visa process much easier. There are two types of Sri Lanka visas for Indian tourists – Electronic Travel Authorization (ETA) and Visa on Arrival. Though one can also get a Visa on Arrival, it is advisable to travel with a pre-approved Sri Lankan tourist visa to avoid any disturbance and hassles in your holidays. Effective since 2012, the ETA visa is an Electronic Travel Authorization granted online through the web based visa system. An ETA is issued only for Short Visits to Sri Lanka for business, tourism and transit purposes. Indian tourists intending to visit Sri Lanka for tourism purposes can apply for ETA online at least 2 months prior to their journey. One can apply for and get ETA within 24 hours by paying USD 20 at the Sri Lanka ETA website http://www.eta.gov.lk. Children under the age of 12 years are exempt from Visa to Sri Lanka Processing Fee. Upon arrival, ETA holders will be issued a 30 day short visit visa at the port of entry in Sri Lanka by submitting their passport and the copy of the ETA approval notice to the immigration officer. A visitor wishing to stay more than 30 days in Sri Lanka may apply for an extension. The Short Visit visa may be extended up to 90 days from the date of arrival at the first instance and further 90 days at the second instance. Beside ETA, Indian passport holders who are visiting Sri Lanka for Tourism purpose can avail the Visa on Arrival after landing in Sri Lanka. Instead of filling the ETA application form online, you need to do it at the airport. It is ideal for Indian tourists who wish to explore the country within 30 days as part of Sri Lanka Packages. It costs about USD 25 which is little bit expensive than if you apply online. Depending on the passenger traffic, the process can take anywhere between 10 minutes to an hour. Since getting an ETA is extremely simple process, it’s best to get the visa in advance. All, Destinations Sri Lana Tour, Sri Lanka, Sri Lanka Packages, Sri Lanka Tour Packages, Sri Lanka Tourist Visa, Sri Lanka Visa Guide. permalink.